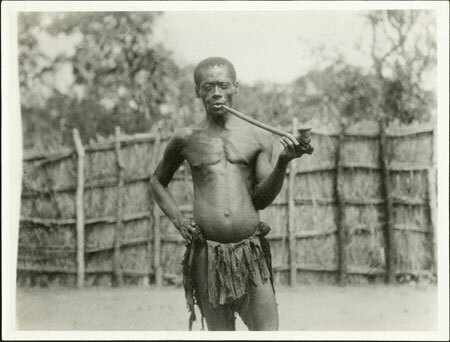 A three-quarter length portrait of a standing man (identified as Tembura) wearing barkcloth and holding a long-stemmed pipe to his mouth with carved head bowl. Tembura is also seen in the group portrait of Prince Gangura and family, and may be one of his sons. Notes on print/mount - "46 +136 334"
Morton, Chris. "Zande man with pipe" Southern Sudan Project (in development). 03 Jan. 2006. Pitt Rivers Museum. <http://southernsudan.prm.ox.ac.uk/details/1998.341.753.2/>.